If you needed any proof that Lego is not just for kids, just take a quick spin through the free LDraw software suite. This serious collection of tools lets you design virtual Lego-like models based on real parts, and then produce 3D renders, part lists, and printed step-by-step construction guides to bring your creation to life in real-world plastic. LDraw's all-in-one installer contains many optional applications and data files which are turned off by default. The construction component of LDraw is called MLCad. Just like most 3D design software, its main viewport is divided into four quarters: Front, Left, Top, and Isometric (or 3D) view. But unlike other CAD or 3D applications, you don't get to free-form: This is LEGO, so you need to build with real-world parts. These are listed in a very long list along the left side of the window. I thought I knew Lego, but I had no idea there were this many parts: The list stretches on and on for thousands of items. It is divided into rough categories (Brick, Technic, Minifig, and so on), but there is no quick-search feature and subcategories can be very long. The granularity can be overwhelming: I wanted to add a Lego person (minifig) to my model. The Minifig list had dozens of different parts with names like "Minifig Torso with Suit and Tie Pattern," and "Minifig Leg Right with Astro Pattern" but I could not find just one complete minifig I could pop into my model: If I wanted one, I had to construct it part by part. I never even considered a LEGO minifig as something built of individual parts before, except for its helmet and any props it is holding. 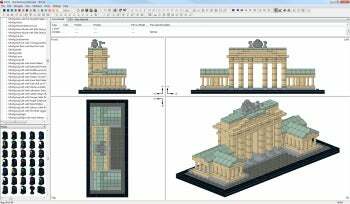 LDraw ships with many pre-built models, such as one of the Brandenburg Gate. While LDraw is very comprehensive, it is definitely missing the commercial fit and finish of the official Lego Digital Designer application. Where LDraw has a lengthy text-only list, Lego Digital Designer has visual parts you can pick from, and even sound effects that play as parts snap together. One area where LDraw makes things easier than other 3D applications such as Google SketchUp and Carrara is placing objects. Since Lego is grid-based, you don't just drag blocks in space: Each block moves in set increments, making it very easy to align blocks. There is an easy to use toolbar for moving the currently selected block along the X, Y, and Z axes. Another major difference in the LDraw file format is that steps are built into it. When you send somebody a complete model, they can then rewind the construction process and watch it step by step, so they can understand what you did or follow along in real life. The included LDView utility lets you see your LEGO models with shading and glossy surfaces. LDraw ships with a large number of ready models to play with and learn from. There are over thirty Star Wars models, including an X-wing Starfighter, the Millenium Falcon, and more. There are also six architectural models, including the Brandenburg Gate and the Burj Kalifa. The models are beautifully crafted, and give a sense of what an experienced user can accomplish with LDraw. The 3D view within MLCad is clear but utilitarian. 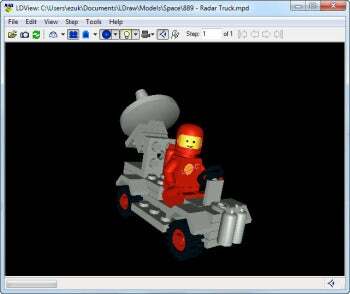 To get a better idea of what a Lego creation may look like, you can run the included utility LDView and load any model file into it. LDView will then present the model in 3D, with convincing lighting and a good level of detail. You can spin the model around, and it even has inertia: Drag along the view quickly, and the model will keep rotating so you can look at it from all directions. LDraw is not a casual toy. It is easy to see how much work and attention that went into making this free suite of tools--and if you are serious about Lego, this is one must-have tool for your arsenal. Note: The Download button takes you to the vendor's site, where you can download the latest version of the software. This is donationware. It is free to use, but the developer requests donations to defray the cost of Web hosting. LDraw is a suite of free applications for designing and viewing LEGO models .